Pull this comprehensive email list of endocrinologists and find hormone specialists today. This pre-built list of doctors is ready for you to download now! 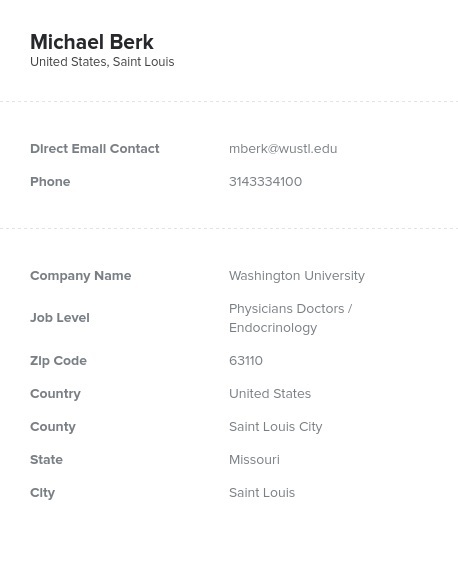 Find specialized physicians within the field of endocrinology with this simple, easy-to-use email database. Endocrinologists study the endocrine system, which is comprised of vital organs that release hormones, such as the adrenal glands, the pancreas, and the thyroid gland. They are important points of contact for diabetic patients, as well as many others with hormone diseases and issues, like thyroid cancer, growth problems, and many others. To get in touch with this uniquely knowledgeable group of specialists, simply download this data product, integrate it seamlessly into your CRM, and start to email leads within minutes. With Bookyourdata.com, you can find the contact information you need to start a targeted business-to-business (B2B) medical marketing campaign: full names, emails, postal addresses, phone numbers, and more. By pulling a vast array of specialists from multiple institutions into one database, this list organizes all of your company's most relevant prospects into one endocrinologist email list. That way, you can more efficiently market to a knowledgeable and interested group of physicians. Contact your sales leads and show them your latest solution for other common endocrine system issues. If you want to communicate directly with hormone specialists and endocrinologists, buy this accurate, verified mailing list of endocrinologists now. As one of our many ready-made data products, it's ready for you to purchase right away.